Popular Lost Cities author David Hatcher Childress takes us into the amazing world of ancient technology, from computers in antiquity to the flying machines of the gods. Childress looks at the technology that was allegedly used in Atlantis and the theory that the Great Pyramid of Egypt was originally a gigantic power station. He examines tales of ancient flight and the technology that it involved; how the ancients used electricity; megalithic building techniques; the use of crystal lenses and the fire from the gods; evidence of various high tech weapons in the past, including atomic weapons; ancient metallurgy and heavy machinery, the role of modern inventors such as Nikola Tesla in bringing ancient technology back into modern use; impossible artifacts; and more. Packed with illustrations and amazing info! 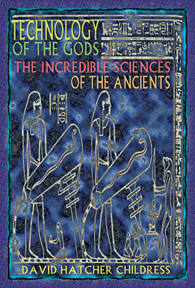 TECHNOLOGY OF THE GODS: The Incredible Science of the Ancients, by David Hatcher Childress. 320 pages. 6x9 Paperback. Illustrated. Bibliography.